…then it almost certainly is right! Never have truer words been spoken than when this well known phrase is applied to cycling. Cyclists adhere to all sorts of ‘rules’, some written, some not. What I find fascinating is how many of these ‘rules’ are underpinned by the ‘If it looks right….’ principle. 1. Non Essential Cycle Appendages(from here on in known as NECAs). I’d originally thought of singling out the mudguard, but on reflection this seems slightly unfair. Instead I’ve extended the point to include all NECAs, including Bells, Dork Discs, reflectors, and anything else hung off our bikes which do not directly contribute the purity of the visual experience. We can all build arguments for NECAs, hell some of us(yes me included) will even have a winter hack/commuter lurking in their stable sporting mudguards, but this should never be seen as an admission that these are acceptable. A contradiction in itself granted, but this is not a black and white business. And as for Dork discs, honestly, WTF? These have absolutely no place on any bicycle ever. Don’t believe the BS too often pedalled that these will save your back wheel if you over shift. It’s quite simple, take the time to get your pride and joy set up properly and this argument can be cast aside, along with the Dork Disc you’ve just removed! 2. Innapropriate Attire. Where do you start? Baggies and/or Camelbak on a road bike, or perhaps the old chestnut of trade team kit(is this ever right?) not matching the bike. These are just two examples of too many. The next time you’re dressing yourself before you roll down the road, take a few moments and have a look in the mirror. Be honest, does it look right? You’ll know the answer instantly. I could go on and on, but these two examples illustrate the point beautifully. It's vin rouge o clock, and here I am reflecting on how my Palmares stacks up in the grand scheme of life…. In no particular order of reverence, the milestones and events are recalled through the haze of Crozes Hermitage, many jostle for relative significance to me, but all fail to illustrate my journey on the humble bicycle. So I thought I would attempt to list chronologically, for the sake of perspective. A family holiday in the Dordogne that started with a couple of days in Paris was a coming together of a diverse group of friends, and resulted in moms, dads, daughters, sons, and friends riding through the streets of Paris to watch the final day of the Tour de France. Perhaps an event never to be recreated on the same scale. That very same holiday, participating in a ride through the rolling Dordogne countryside, and for the first time in what seemed like years, I experienced that feeling of complete liberation. The fact that I was riding a Halfords sourced BSO and wearing flip flops did not detract from the feeling that I had seen and felt what the future could offer. A loop, starting and finishing in Shifnal, in the dark, the first time on my new road bike which I’d purchased only hours earlier, in fact the first time on a road bike in nigh on 30 years! Amounting to about 35km, which was typical for the group I joined on that life changing night in January 2011. Some weeks later on a midweek ride in the dark, breaking the 50km barrier, and feeling like I was now invincible. I had, in truth, not conquered anything. I had simply become a victim, drawn in by perhaps mankind’s greatest invention. About 110km or thereabouts I was told. Why not I thought. It's only twice as far as I have ever ridden in my life! Heading into Worcestershire to my home town of Kidderminster brought back some great memories. What was less familiar was how lumpy that part of the world was compared to the relative plains of mid Shropshire. Lumps which I’d never noticed before whilst in control of a motor powered tin box. However, armed with bananas, gummy bears and 2 bidons.....2 bidons! 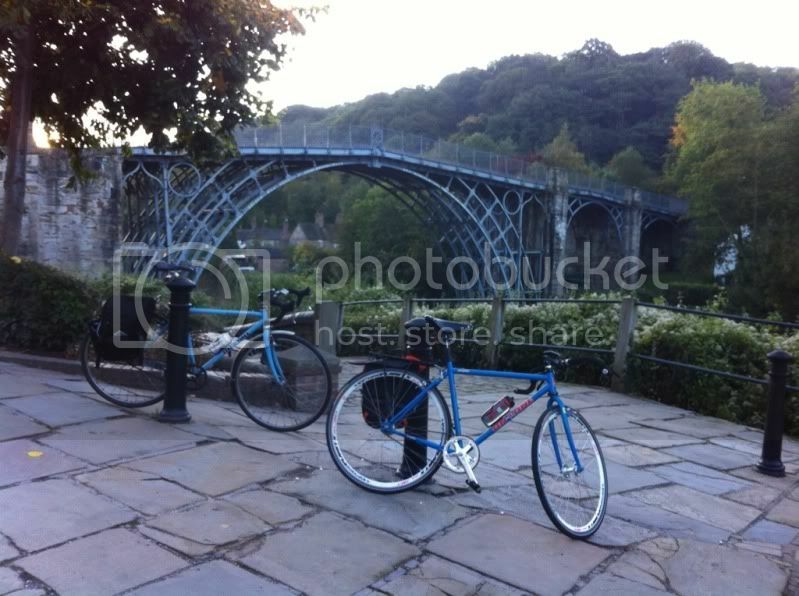 !, a cuppa in Bewdley, a can of Coke and a Mars bar in Highley, I had cracked the 100km barrier........by about 30km! It's only 13.5km long, and has 21 switch backs! How hard can it be? Let’s just say that if the first 3 or 4 km continued much further, about as hard as it can get! However, the gradient eased as the hairpins passed, each with the names of stage winners shimmering in the alpine sun, and all of a sudden 1860 metres above sea level was in reach. I was following in the wheel tracks of giants. It spurred me on, and my cadence had increased! I’d passed Dutch corner, and had survived the 110Dba Euro Pop being played on the keyboard by the orange gimp suited Dutch version of Richard Clayderman. Alpe d’Huez was in my pocket. Grinding the climb out from Bourg D'Oisans to the Col du Lautaret was complete contrast to the Alpe. False flats, dramatic scenery, a civilised stop for amateur EPO served in a red can with white writing, the feeling that the Galibier taunted me that today was not my time. It was chaos at the Lautaret and the Galibier looked down menacingly, growling at the MAMILS attempting to break the first line of its defence, clad in jack boots and faggoty hats. 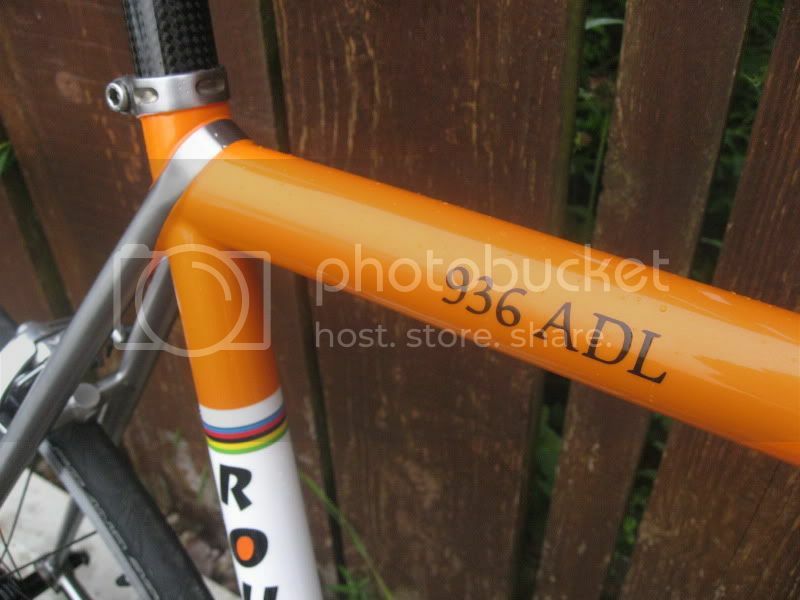 One day, I vowed to put the Galibier in my back pocket. However, today was not that day, Today was the day of the 40km descent, yet another new experience. How about a 200km circuit of Shropshire, over a couple of days? Why not, I'm in. A 4 man peloton rip up all the lumps and bumps that West Shropshire can throw at the bicycle, before the Gruppo Compatto rolled into the Premier Inn in Oswestry to be greeted by wives and children, who still appear to be pleased to see us despite us being clad in Lycra that has become part of our epidermis for the last 7 hours and 130km. A relatively flat route via the northern part of the county delivered the peloton back to HQ(The White Hart in Shifnal) for malted recovery beverage consumption. My first multi day tour was in the bag! It's an entire day. Nothing else can be planned for this day. Organised in conjunction with The Velominati, The Shropshire Hills Cogal results in 11 semi pro cyclists, with detailed knowledge of the sport, prepared to lay down the V in spades, and me. Today was special in so many ways. It was an imperial century, it was a day of climbing, it was a day of short and sharp, and long and hard climbs. It was the first time I had ever dismounted and pushed up a wall of Tarmac, ever! And today I did it twice! It was a day that took me to a point of exhaustion that I didn't think possible. Little did I know, there was so much farther to go on the level of exhaustion that the human form could experience. I just wouldn't know that until some point in the future. Working as a team has always been something I love doing. Cycling is such an individual sport, how could it work as a team at my level? A 2 man time trial team set out to complete a specially selected 100km route in under 3hrs 30mins. Surely not possible, but we can set a benchmark to work on in the future to crack it through hours of dedication in all weathers. For the first time ever on a bicycle, my ride partner was a team mate, working to a common goal. The time on the front was shared, the time wheel sucking was the opportunity to reset the mind and refresh before hitting the front once more. 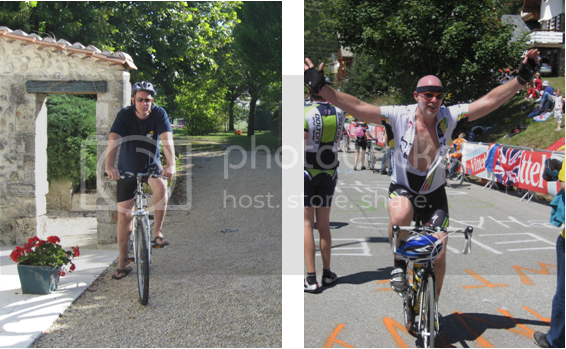 All that needs to be said is that the drink afterwards was a celebration of a 3hr 11 mins, 100km ride. You can work out for yourself what the next target will be! My lungs were exploding out of my jersey. 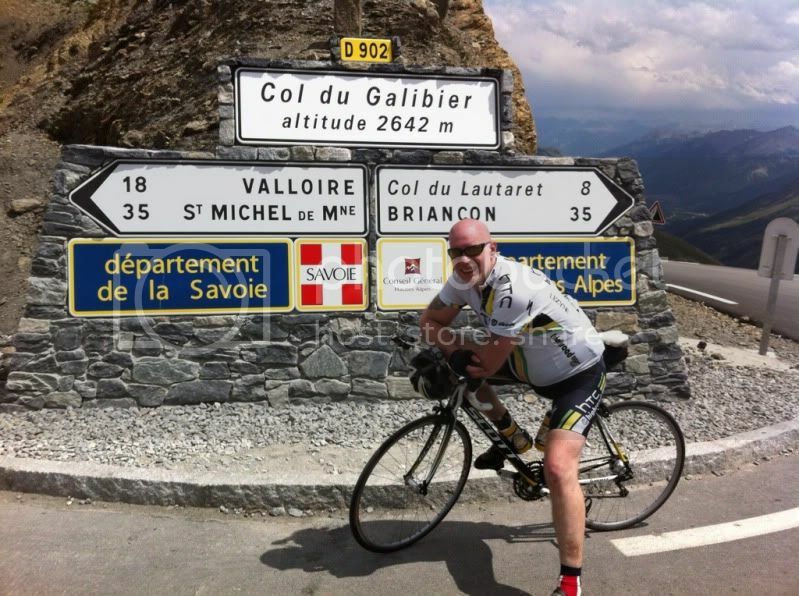 But the pocket on the rear of my jersey was being stretched wide open, as I was about to put the Col Du Galibier in it. I had vowed previously that I’d return to take its scalp. Anyone with any sense would have turned around after the photograph at the top, and headed back whence they came. Not today though, and having climbed the Telegraph, and the Galibier, we were going to drop off the other side, down to the Lautaret to Bourg D'Oisans , and climb the Glandon, and perhaps even the Croix de Fer, before heading back to Saint Jean de Maurienne. Andy and I exchanged looks. You sure? YOU sure? There's no turning back now! Lets just say it was all going well until the last 10 km of the Glandon climb, when I had to resort to hitting the eject button, and flagging down a random French man in his Renault scenic, with 2 of the most frightened children I have every seen. Handlebars irritatingly close to their nasal orifices, and a shadow of a man who spoke some weird alien language whilst leaning out of the window shouting ancient Anglo Saxon abuse to a labouring cyclist along the lines of " a la summit du Glandon". By the time Andy had reached the summit, I was wrapped in a blanket handed to me by a concerned Ham Carrying Belgian. The descent of the Glandon on the north face is worthy of a return visit in order to climb it. I picked a tweet up whilst on holiday. Project ‘SAS’ was being planned in a couple of weeks. Following 10 days in the sun, drinking and eating my own body weight each day, of course I said yes. But for the first time, I was unsure, and not at all confidant that I could complete this one. So what did it entail? Shifnal to Aberdovey back to Shifnal. 300+km in 1 day! Aberdovey came into view after about 6.5 hours. Latte and carrot cake hit the spot, before the short hack to Dollgellau for the support vehicle picnic. Bala and the following climb was dispatched , and it was not until we rolled into the village of Knockin just before 6pm that I began to smell success. We only had about 50km to go, but when you have 250km in your legs, 50km really does seem like a trip to the park with the kids. The slightest of inclines resulted in gears being shelled all too quickly, but when finally the silhouette of the Wrekin was in our sights, the gravity of what had been achieved seemed to crystallise in my mind. The pace quickened, the mood lightened, and a truly epic ride had been completed. I had done the Rourke cycles Cat & Fiddle charity ride before, but never with Mow Cop included for good measure. It is short and sharp, I was lead to believe. Sharp it is. Short........it's long enough. Resorting to tacking across a road no wider than 5 metres in order to get past the Chesire View pub, whilst coming to a virtual standstill at each half turn of the pedals, albeit for only 100 metres or so, left me feeling perhaps the most fatigued and gun-achingly painful I think I have every felt. And I loved it! So what does all this mean? I have hit personal milestones during my short time cycling, that when I started I didn't even consider as they were so far into the distance, they could never be achieved....could they? Not bad for someone who has been cycling for just 21 months. The only problem I have is, what targets do I have for the next 1, 2, 5, 10, 30 years? Whatever they are, I shall love every turn of the pedal, every bead of sweat, every scream from every sinew of quadriceps , and the sense of satisfaction and personal achievement will make the coldest, hardest, wettest , darkest ride, just a vehicle to make the ascent of an alpine col, with piercing blue skies, all the more enjoyable. What a truly momentous year it’s been for cycling in Britain. A World Champion, our first ever winner of ‘Le Tour’, as well as another dominant display in the Olympic Velodrome. However, it’s not the professionals that I find most encouraging, it’s more the way in which as a nation we seem to have been inspired to get on our bikes. I only need to think of my group of friends to demonstrate. People who looked upon me as some kind of lycra clad weirdo not all that long ago, have seen the light. BSOs have been sold at car boots, and in their place are machines that do justice to the bicycle. This phenomenon has led to me feeling an added burden of responsibility. Whilst I’d never consider myself as a cycling sensei, I take Rule #3 seriously and feel a great sense of duty to guide the uninitiated. Whether this be guidance on which machine will suit their needs, to the removal of dork discs, through to the correct way to build malted recovery beverage consumption into any ride. This is a serious business. It’s all worth it though, and there’s no doubt that our society is stronger now than it’s ever been. Bikes have come and gone over the course of the year, and many great rides have been completed. I’m convinced that we’ve reached a critical mass and that things can only go from strength to strength in 2013. There was only ever going to be one way to mark the completion of my fourth decade on our tiny planet, and that was to go and ride the bike which earlier in the year had had built to mark this occasion. When we realised that the 2012 edition of the Rourke Cat & Fiddle Challenge ride was scheduled on the actual day of my 40th, it was a done deal and the entries were in. Routes were planned, hotels were booked, and loins girded. To make it a bit more of a challenge we’d decided to add the small matter of Mow Cop into our challenge to spice things up a little. We were also planning on riding up to the event the day before and making a weekend of it. I’ve never considered myself to be righteous, but the sun certainly shone for us, and after a murky start the sun broke through and we were treated to a glorious day. The views were as spectacular as the route itself, and we enjoyed an awesome day in the saddle. This route provides plenty of climbing, along with some quite banzai downhill sections on the A53 running into Leek. Just about as fast as I want to go clad in lycra thank you very much. Our second metric century ride of the weekend, it was time to head back to Shifnal for some much needed malted recovery beverage consumption. The curry which accompanied was as well deserved as it was delicious. It was a full on party as over 30 of us crammed into the Royal Bengal. The cycling theme was even in evidence on my birthday cake, as Julie P had decorated it with little bikes! In what can only be described as another co-incidence perhaps my favourite local band, Hot Rod 55 were playing at Odfellows that evening too. So kids despatched to the babysitter, it was time to time to enjoy some excellent Salopian Oracle watching Rockabilly music at its best.